It's been done, but (apparently) not in a cartoon. I once texted 'The sky's in love with you' to a beau. She thought I was being obscurely poetic. I've seen that joke in another comic which is posted on a wall in my linguistics department. 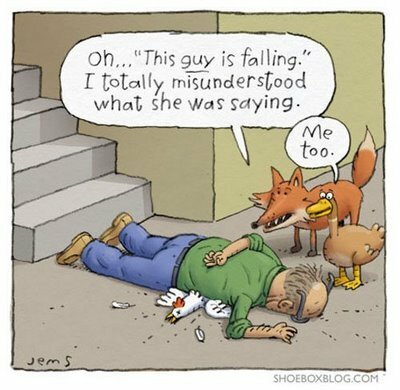 I'm not sure what comic it is, but there's a chicken saying roughly "No, this guy is falling! This guy!" and everyone around is worried about the sky falling on their heads, but the chicken is trying to get people to notice a guy hanging from (or already falling from) the outside of a tall building nearby. Shouldn't that be to a belle. No, she was a transvestite. Merci, Etienne. "I once texted 'The sky's in love with you' to a beau. She thought I was being obscurely poetic." I mean, is it me, or does casually saying "the sky is falling" in your head sound slightly different than if you said it to yourself. It's like when you're actually saying it that you deaspirate the /k/, but if you're reading it silently to yourself, it's as though the aspiration is still there… hence why I don't really notice the pun unless I actually *say* it out loud to myself. Excuse me, while Ike IS this guy. Unfortunately, speakers without the Weak Vowel Merger don't get the joke. Well, at least not so much. Well, to me, the vowel in "bit" and the vowel in "the" sound almost the same if they are unstressed; in fact they are remarkably similar for vowels diverging in both backness and height. They aren't really merged for me however. I really do not get it. Please explain. It has been done in cartoon form in "Rubes" by Leigh Rubin, in 1990, and it appears on page 234 of Fromkin, Rodman, and Hyams, "An Introduction to Language", 7th ed. I doubt it's kosher to reproduce that here and I can't find it online, but in that case Chicken Little is vehemently warning the nonbelieving observers about the gentleman who is still above them, falling off a ladder. The caption reads, "Boy, he must think we're pretty stupid to fall for that again." Pez, the wikipedia article on the Chicken Little fable will help. Stephen Jones: "Belle" doesn't work, as in English, it has a distinctly different meaning the "beau" beyond just gender. This is another joke that Gary Larson did first, although I don't have a link to the comic on hand. My father has always enjoyed regaling me with stories of his classes under John Ohala, in which Dr. Ohala recorded students saying "spy, sty, sky" and then played back only the last two phonemes, interpreted (to the students' amazement) as "by, die, guy". On a (perhaps) related note, producing a voiceless unaspirated stop (at least one which I perceived as clearly different from voiced) in stressed-syllable-initial position was one of the things I had the most trouble with when I was first learning linguistics. I recall listening to the radio while driving and hearing a station's call letters as "WFAG", and thinking how odd it was that a station would get (or accept) such a call sign. After listening a while I realized that the station's ID was actually "WFHE". "Pez, the wikipedia article on the Chicken Little fable will help."